John Kenneth Muir's Reflections on Cult Movies and Classic TV: Muir in The New York Post! Today's New York Post features an article called "Risky Business" by reporter Barbara Hoffman. It's a piece about the movie musical art form, and the current difficulties it has winning audiences (and profits...) in the cinema. Ms. Hoffman interviewed me for the article, and I get a few good quotes in it. Between the New York Daily News last week and The New York Post today, I'm really gettin' around these days...and I have the arrival of Rent to thank for it. Just like actual Broadway productions, film musicals are costly to mount, making them dicey propositions. Plus, the singing cowboys of "Oklahoma!" and the swinging gamblers of "Guys and Dolls" are a hard sell to a generation bred on reality TV. "In this day and age, we don't accept the old convention that people just burst into song," says John Kenneth Muir, author of "Singing a New Tune." "You have to have a canny director to find the right film translation..."
have you caught any of the animated musicals over the last five years or so that went straight to dvd and were synched directly to albums, such as interstella 5555 (daft punk's discovery) and wave twisters (dj qbert's album of the same name)? like yellow submarine all grown up. I haven't seen any of those (nor heard of them!) 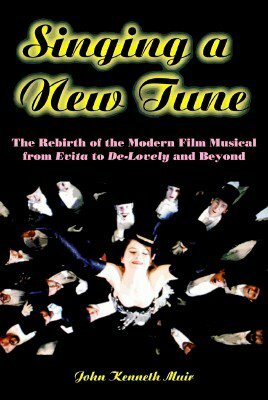 But since the movie musical is a classic format, it does the heart good to know that somewhere someone is still making 'em.